Q: Speaking of goals, it seems earlier on there wasn’t as much of a focus on winning the national championship than there was in later years. Does that ring a bell? 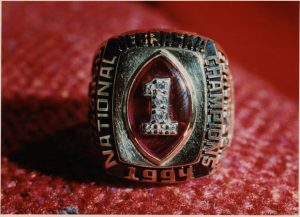 Do you recall the first time it was spoken outwardly, “Hey, our goal is the national championship”? TC: I remember early on in camp we would be in an all-team meeting, we would sit in there and would put down that year’s goals on the whiteboard, and they would get each position and each game goal. You’d have this many yards per rush and all that, but I can remember ‘Winning the Big 8’ at that time, ‘Winning the bowl game’, but really Coach always kind of had the philosophy that you take care of those steps along the way, the things you can control, not the things you can’t. And the mindset was, “You can’t always control winning the national championship, because that’s up to the voters.” At that time there was no mathematical poll to get you in there, so at that time we didn’t really put that as a goal, because the theory and the concept was if you achieved all the goals, that’s gonna come, the fruits of your labor, right? That was kind of the underlying fact: you knew that if you took care of business you were gonna have an opportunity to compete for a national championship. Q: Tell me about Charlie McBride. TC: (laughs) Charlie is on my speed dial right now. Coach McBride and Coach Osborne are two of the best guys and role models that I’ve ever had besides my own father. Coach McBride was the most genuine guy you would ever meet. You might not always like the feedback you got, but you learned that you don’t take it personal, that he’s doing it to make you a better person or a better football player. Q: Did Charlie have any frequent sayings? Q: (laughs) Was that just with you? Or others, too? Q: You know that Kool-Aid was invented in Nebraska? The first year and a half, two years I was there my typical conversations with Coach McBride were, ‘Yes sir’, ‘No sir’, and ‘Okay, sir.’ (laughs) But oh, my goodness, the best defensive line coach. I can’t imagine there being a better defensive line coach as far as knowing football, as far as knowing technique, just a brilliant guy. One of my best friends to this day. We talk several times a year and when he gets back we try to get together. He’s the best. Q: How would you contrast Coach McBride’s style with Coach Osborne’s? TC: I think there was something there, the defensive mentality. I’ve always said I think a good defensive coordinator has got to have a screw loose. You’ve got to be fiery, you’ve got to be intense. And offensive players and offensive coaching? Certainly adrenaline and effort and everything will get you a long ways, but I think it probably gets you farther on the defensive side. Pure hustle, pure heart, pure determination will probably make up for some technique errors and some strategy errors, if you’ve got eleven guys flying to the ball. Coach always used to say, “If you screw up, you screw up going 110 miles an hour.” If you screwed up going half-speed he was really gonna get exasperated, but if you’re screwing up 100 miles an hour you could make up for it. Charlie was really intense in practice. You saw it, he could get in a guy’s grill and chew a guy’s tail and spit and swear, and you didn’t want to be on the other end of that tirade. And certainly, I saw some of the offensive coaches do that, but certainly not to the extent that Charlie and some of the defensive coaches would. TC: Yeah. And Charlie did, he hated when you did that. I can remember him saying, “Dammit guys, if you’re gonna do that you better make a play.” If you don’t, you might not be in the game too much longer. TC: It’s a deal where you’ve been kind of setting a guy up for a play like that. Occasionally, you lull them into the situation where they haven’t seen it all game, and if you do pull it out you better make it work. Q: Terry, who was the first person you befriended when you arrived on campus? TC: Paul, I was very fortunate to have a wonderful bunch of guys that I came into the program with in my recruiting class. It’s really hard to pick one guy out. And even to this day, those guys are still my best friends, the guys I played ball with. And not just my class, but other guys in the program. When I came on campus we all bonded pretty quickly, a bunch of us, and maintained those friendships and have still done so. The one consistent guy that I lived with, Jason Pesterfield, I lived with Pesty for 4 out of the 5 years I was in college. Q: He was from Oklahoma, right? TC: Yep, Paul’s Valley, Oklahoma. We still keep in touch. He lives in Dallas now and we talk and see each other several times a year. TC: Man, that’s a name I haven’t heard recently. That doesn’t surprise me. Corey had some pretty good wheels. I can see some pretty good soccer players coming out of that. Q: As for a mindset, an attitude, as inspiration… what drove you? TC: You know, I think it’s something that I was fortunate, Paul, that that was instilled in me by my parents. 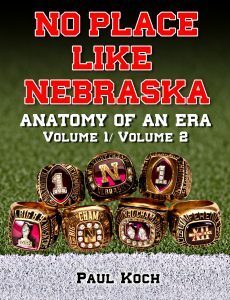 But to take it a step further, when I got to Nebraska that was instilled in you by Coach McBride and by the upperclassmen. I can always kind of remember a pride factor among the defensive linemen, that “You’re never going to be outworked. Whatever it takes, you’re gonna work harder and do this and that.” It just seemed like it kind of trickled down. I learned it from the Kenny Walkers and the Pat Engleberts and the John Parrellas. It’s something that, after I was gone it was the Peter brothers, it was just something that we had a lot of pride in, the defensive line, that we weren’t going to be outworked. It came from Coach Osborne and Coach McBride and we were fortunate to have a bunch of guys that bought into it and truly tried to live it. Q: Did playing with Kenny Walker leave any impression upon you? TC: (laughs) Kenny was a fifth-year senior when I came in as a freshman, so I was Kenny’s blocking dummy my whole redshirt year. So Kenny left many impressions on me, mostly black and blue bruises. (laughs) Here’s a guy that had an interpreter with him so that he could understand what was going on and had to get his defensive calls by hand signals and all that, and it really had an impression on me. Here this guy is deaf, is a fantastic football player, and nobody works harder. If anybody could make an excuse it would have been Kenny, and I never heard him make an excuse. It really was pretty inspirational to see a guy that had that handicap be such a great teammate, a great player. But Kenny was a guy that nobody outworked him. He was a pretty special guy. Q: I ask that question to maybe find if there was something that was a part of your early learning and inspired you to carry it into later years. Who knows, maybe it made the system better, made the coaches rethink what they were doing, etc. TC: Yeah. You know, I think there were a couple things I was the beneficiary …one of those was when Coach Osborne and Coach McBride decided to make the switch full-time from the old 50 defense to the 4-3. My first three years, my redshirt year and then as a freshman I played just a little bit, we were pretty much exclusively a 50 defense at that point. We would run in what we called the Dime Defense occasionally on passing downs, but maybe that was, I’m guessing 10-15% of the plays? The majority of the time we were in the 50 defense. My third year, when I was a sophomore, I was on the first string Dime Defense and we would start the game in the 50. Every game we started in the 50 and as the season went on we ended up playing -it switched- the dime defense 90% of the games. Oftentimes we’d only be in the 50 the first 4 plays and bring in the dime and play the rest. We figured out we could stop the run with the dime just as good as we could the 50 with all that speed on the field. We kind of got to a point where we were the read and react defense at some times (which the 50 was a little bit), then we got into an attacking defense and all of a sudden we had some guys on the defensive side of the ball with speed at every position. At the linebacker spot you had Ed Stewart, Doug Colman, Phil Ellis, Mike Anderson, these guys could all run. And all of a sudden, I’d like to say there was some profound thing that I did or was instilled, but that wasn’t the case. I think a lot of that credit has to go to Coach Osborne and Coach McBride for evolving and being willing to kind of step out of the mold. We were in the Big 8 and you thought you had to run the 50 defense to stop the run, and they stuck their neck out and decided to play a 4-3 defense in a running conference, and it turned out it worked pretty well. Q: Coach Darlington said about the same thing, how he used to chart the efficiency of the various defenses and how the dime package was just as successful as the 50. I wonder if his talks with Charlie might have helped that change along. TC: It was an evolution all of a sudden. I don’t think my junior year we hardly even put the 50 defense in. We had a few wrinkles for some things, but it almost went exclusively to the 4-3 my last two years there. Q: Do you have a favorite play or favorite moment? TC: You know what, that’s kind of a tough question because there are so many. 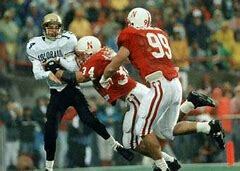 It was really special to me, playing for Nebraska had been my dream and I was fortunate enough to live it and be there at a time when there were a lot of great players coming together. Q: The plays where you took a twelve inch step with one foot and six inch step with the wrong foot and were out of position? TC: Yeah, and then I had to hear about it in meetings on Monday. You might spend a lot more time on those the next week in practice than you did the successful plays.